Al Eiman Group of Companies has installed a High Definition CNC Plasma Cutting machine of Turkish make in our premises. We undertake cutting jobs for MS,SS& Aluminiyam materials of any profile as per your AutoCAD drawing.Our machine is capable to perform Good quality Cutting & Fine Marcking simultaneously.Machine Bed Size is 6 Mtr x 2.5 Mtr. Mild Steel of any grade up to a maximum thickness of 60mm. 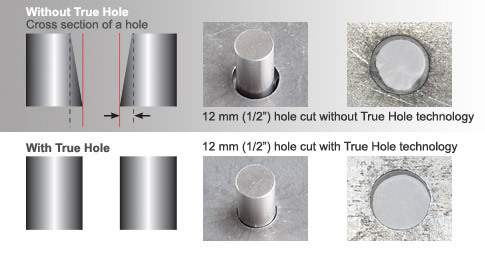 Our Latest True Hole cutting technology for mild steel produces significantly better hole quality than what has been previously possible using plasma. This is delivered automatically without operator intervention. Cylindricity is a measure of hole quality. True Hole technology requires a HyPerformance Plasma HPRXD auto gas system along with a True Hole enabled cutting table, nesting software, CNC, and torch height control. Consult with your table manufacturer for more details.